Keep your certification valid! Every three years from your original designation date you'll need to recertify. But don't worry; it's not like going to the DMV to renew your license. To keep your CPP valid, all you need to do is acquire 15 Continuing Education Units (CEUs) or retest. Once you've achieved the CPP designation, you will need to recertify every three years. CPPs eligible for recertification will receive three notices on the year they are due to recertify, two via email and one via mail. 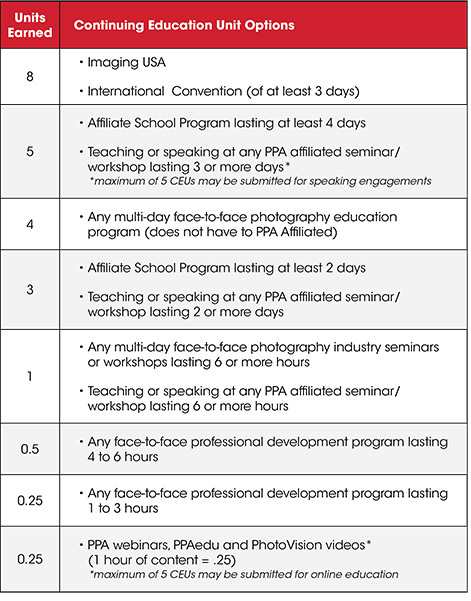 The CEU system involved in the CPP recertification process is there to encourage CPPs to continue their journey in photography education and professional development. By participating in continuing education, CPPs help to raise the bar of our industry. Please review the chart below to learn how to earn CEUs or where your CEUs may fall under the CEU point structure. You can submit your cumulative CEUs online by filling out the Recertification Education Unit Tracking Form. What if I can't meet the Education Requirements? If you can't meet the Education Requirements, you can always take the CPP Exam again. You can take the exam in-person or online. Unfortunately, if you are unable to fulfill one of the recertification requirements (15 CEUs or pass the CPP Exam) within your recertification period, your certification will be discontinued. To apply for an extension or request additional information or assistance please email cppmailbox@ppa.com.